After nearly a decade of writing about and reviewing teas, I’ve gotten pretty good at judging what tea is worth trying before I even drink it. This is particularly true for matcha. I say no more often than I say yes for this category because it is fraught with counterfeits and just plain bad tea. One of the most important things that I look for is detailed sourcing information. I want to see more than just “Japan” listed on the label. I’m in the camp that believes that products labeled as matcha should only come from Japan so I am unlikely to agree to review a tea that was sourced from China or elsewhere. Jing Tea is a London based brand with an impressive commitment to sourcing authentic teas that express the true taste of their origin. 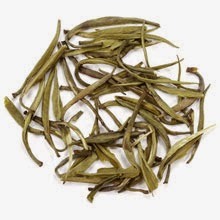 On their website, they list the prefecture as well as the cultivar used. This indicates that they know where their tea is coming from. I also thought it was interesting that they included where the tea was milled. This information that tea lovers are rarely given. It was also nice to note that the farm where this tea was produced is in the process of converting to organic standards. I had the pleasure of reviewing their Jasmine Pearls Supreme earlier this year and really enjoyed it so I was excited to whisk up a bowl (or two) of their matcha. Right off the bat, I knew I was in for a treat because of the vibrant green color of the tea. I couldn’t resist snapping a few pictures before I even had the pull tab lid off all the way. The taste was vegetal and sweet with a surprisingly creamy finish. There was some expected bitterness but it was mild and was quickly balanced by the teas inherent sweetness. It frothed well without a tremendous amount of effort, even when using a very beat up chasen. Not all Japanese tea ceremony schools emphasize frothing but if your tea refuses to froth, run for the hills. That is an indication of a poor quality tea with low levels of saponin. Good matcha is not cheap but this one is about the middle of the pack of what is available out there. The exchange rate doesn’t exactly favor those of in the US these days but it is still worth picking up a tin if you are in need of a refill. Matcha sample provided for review by Jing Tea.